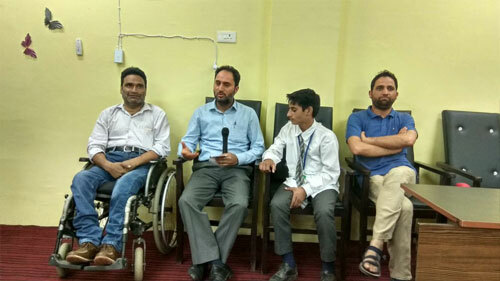 An awareness programme regarding disability rights was organised by University of Kashmir South Campus, Anantnag in collaboration with Humanity Welfare Organisation HELPline, Bijbehara. Around 100 students including faculty members, ministerial staff and students with disabilities attended. The Director of South Campus Dr. Ashfaq Ahmad Zarri, chaired the event. The event was organised and facilitated by the Department of Education under the leadership of Bilal Ahmad Kaloo, assistant professor of the department. 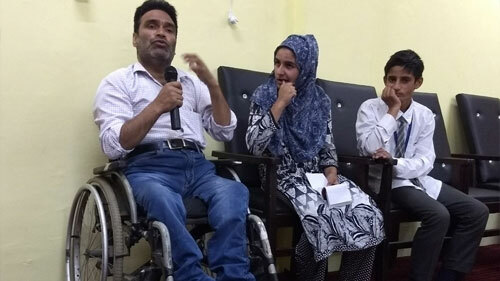 Speaking at the event Javed Ahmad Tak, chairman Humanity Welfare Organisation HELPline, Bijbehara said that persons with disabilities can be contributors to society if provided a conducive atmosphere to seek education and employment. He was of the view that all educational institutions should be made disabled friendly. The architectural barriers should be removed and access to class rooms libraries, recreation rooms, auditoriums should be accessible, so that students with disabilities seeking higher education feel highly satisfied and stress free. The accessible websites and soft books should be available for students with disabilities so that they could seek education in an inclusive setup without any discrimination or separation, Tak added. He also advocated for tag system and availability of sign language interpretation facilities in programmes where in all the persons with hearing and speech disabilities could also be included in all types of activities. 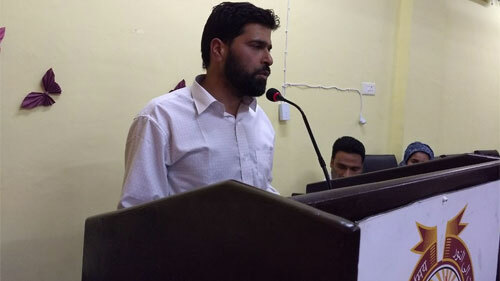 While interacting on the event Tariq Bashir an assistant professor with blindness presently posted at government degree college Utrusoo in distrct Anantnag gave detailed information about challenges faced by persons with blindness in day to day life. He suggested all universities should set up barrier free libraries with complete facilities for the students with blindness and low vision. Tariq Bashir said that all persons with visual disabilities are no longer disable if they have access to modern technology. He stressed that educational system should adopt modern technology to ensure appropriate educational system for the persons facing visual disabilities. 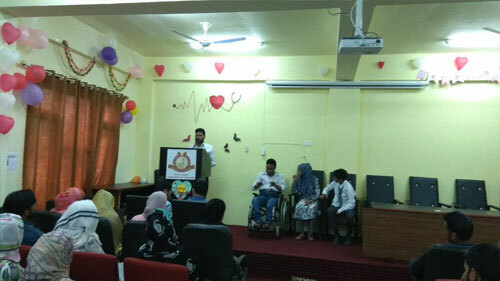 The specialty of the event was the Presence of students with disabilities of Zaiba Aapa Institute of Inclusive Education. Two students with speech and hearing disabilities who were siblings communicated with the help of sign language interpretation. On a written chit Ifla Syed a student with hearing and speech disability in writing requested the Director South campus that please make the campus disable friendly. The Director of South Campus Dr Ashfaq Ahmad Zarri thanked the guests for their presence and creating awareness among the students and faculty members along with the ministerial staff of the university campus. Dr. Zarri assured Ifla Syed that south campus of university of Kashmir will play active role in removing barriers and creating accessibility. In addition Dr.Zarri assured that in both capacities Director of campus and as human being his all efforts will be inclusive till life. Director South campus announced creation of special cell for facilitation of students with different disabilities and establishing laboratory facilities for special education students where information about catering all types of disabilities will be available.